Have a drink on Eastern Counties! Eastern Counties will be serving drinks at Twickenham on Saturday before the England v Wales game and it would be great to see anyone associated with rugby in Eastern Counties. 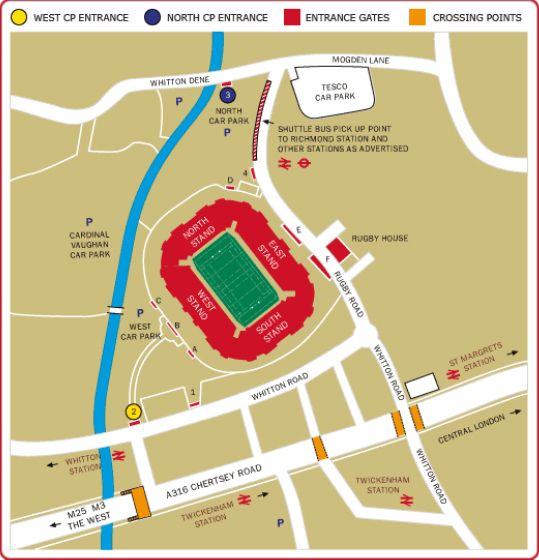 This year we have been moved to the Cardinal Vaughan car park as the West car park has become part of the main concourse. The car park is accessed via a footbridge from the West car park (see map below). I will be there with various ECRU people and we hope to be set up by 2pm, serving beer (supplied by our sponsor Greene King) and wine until 3:30pm. Look out for Eastern Counties banners next to a white Citroen 4×4. I will post the exact location on Instagram, Twitter and Facebook on Saturday morning. Come and say hello! I will do my best to get there! I note that many of Holt’s 1st XV enjoyed a game playing in the 2nd XV against West Norfolk RUFC. I struggle to see how this fits in with the RFU’s core values of Respect and Sportsmanship, I think Enjoyment was fairly warped as well. Sadly, I guess that ECRU will come up with some bluff rather sanctioning clubs Ist XV and players for this “jape”.